Today I’m loving … these turquoise chairs. I like how they really pop out! The bar stools are from IKEA. They look very different with a bit of paint. 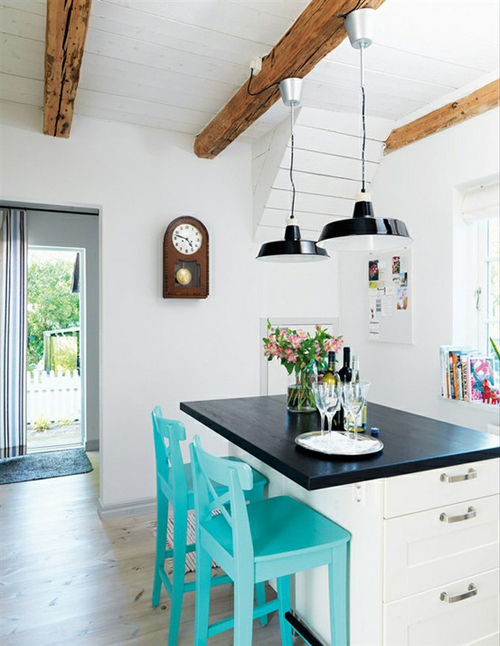 You can see more of this Swedish summer house here. I love that colour! I am trying to convince my husband to let me paint the back of our front door that colour 🙂 Maybe I should just start with some bar stools first! oooh those chairs! It’s like a fresh jolt of color therapy in the morning. Thank you! PS Danielle, I just put Le Souk in the resource section of my forthcoming Moroccan interior design book. yes! beautiful color! less is more. This makes me super happy. I love turquoise and I’m a bit prejudiced against bar stools. They often look clunky and weigh down a space. But these, I love. Thanks! I love those chairs! Nice color and style. I will be very happy to have a pair of those pretty chairs. Beautiful colour! Think my bathroom could use some accent pieces in turquoise. I absolutely love the color of these chairs. Can you please tell me the paint you used for them? I have searched and searched and cannot find a turquoise or teal in this same light bright shade!